By subscribing to selected Scentbird perfumes, you will be able to perfectly harmonise your fragrance with your current look and mood, over and over again. »Perfume puts the finishing touch to elegance: a detail that subtly underscores the look, an invisible extra that completes a woman’s personality. Without it there is something missing.« These are the words of one of the greatest legends of the fashion world, the Italian fashion designer Gianni Versace. His attitude to fragrances did not stop at eloquently talking about them: he backed his words with actions. Not only in the sphere of femininity but he also expanded his view to the area of men’s fashion trends. He was so good at it, that his men's fragrance with the meaningful name Eros became one of the best-selling perfumes in the American online perfume store Scentbird. The store offers over 450 different perfumes by famous and not-so-famous fashion designers, including some that only the greatest fans of beautiful scents will recognise. It’s done through the system of life per month: you pick a fragrance and subscribe to it, after which you will receive it in your home every month. For 15 dollars a month, a subscription to Scentbird will provide a monthly dose of your favourite perfume, which can be swapped for a new favourite the very next month. According to Scentbird, the monthly quantity of eight millilitres will cover you for exactly a month, costing 15 dollars (new subscribers get the first box for about 11 dollars, including a handy case for the fragrance atomiser). If you disagree and want your fragrance to be a bit more intense, you can get two atomisers instead of one (for 25 dollars), or even three (for 35 dollars) per month. Either way, Scentbird will make sure that you will smell a little different each month, since you can swap the selected perfume as you please. If you cannot get over a specific fragrance, you have the option of a one-off purchase of the entire bottle, in addition to the option to subscribe. Their service is simple: upon registering, Scentbird will open the door wide to the fragrance »waiting room«, where you can arrange the desired products according to which month they should be delivered. You can also rate the fragrances: the more active you are, the more personalised your options will be. If your olfactory receptors cannot make up their minds, you can choose between several joker options that will help you make the right choice. These include pre-compiled selections of fragrances, such as fragrance of the month, new and improved fragrances, best-selling fragrances, as well as fragrance lists according to occasion, fragrances for passion, and even »unusual« fragrances. Scentbird’s service has now won over more than 250,000 subscribers in the USA, which is currently its only market. You can explore the fragrances according to type and choose between eau de toilletes, perfumes, eau de colognes, perfume oils, and essences. Or you can browse by brand, flavour, or ingredients. 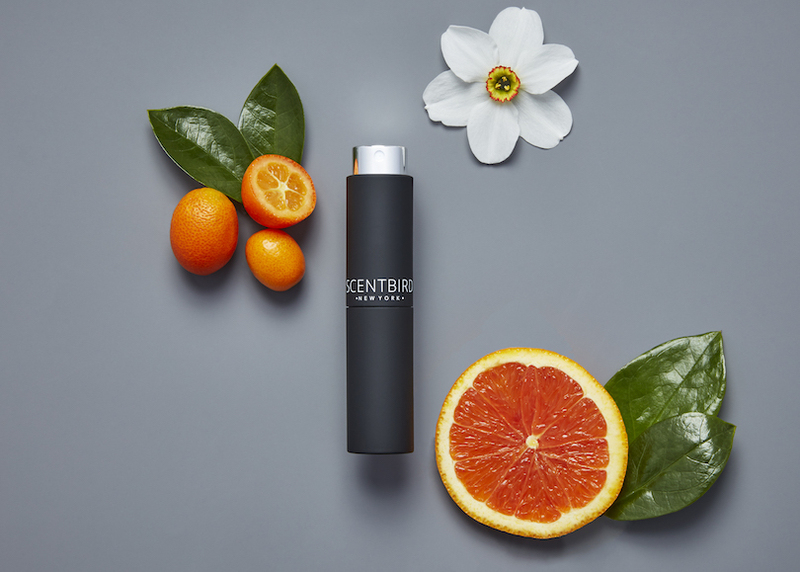 If you get a craving for cucumber, cypress, cinnamon, or clementines, Scentbird has the solution for you. Is even this not enough to help you find your true, favourite fragrance? In that case, you should do the quiz created for you by Scentbird. Where would you most like to be at this moment? In the bakery, at the florist, among citrus trees, in a private library, on the sea shore, or at the spice market? What usually tempts you? Strawberries, chocolate, flowers, incense, leather, citrus, wood...? What's your favourite drink? Cocktails, coffee, dairy, smoothies, tea, water, wine, or whisky? Once you have answered the questions, you will be asked to pick three perfumes you like, and Scentbird's special algorithms will get to work to discover the candidates for your new favourite scent! And if you remain undecided after doing the quiz, the fragrances can also be recommended by the stars. Not literally, of course. The horoscope will do it for them. With all the options available, Scentbird is well on its way to becoming an indispensable element of your daily ritual in front of the mirror. At the moment, it's already uniting over a quarter of a million subscribers, but is currently only available for perfume fans in the USA. Vam je všeč, kar ste prebrali? Vas zanima več o naročniški ekonomiji? Naročite se na naš tedenski sveženj novic o panogi, ki spreminja trg. Do you want to find out more about the subscription economy? Subscribe to our weekly newsletter on this market-revolutionising industry.